Hundreds of millions will watch the big game... billions of dollars will be gambled on its outcome... and tons of pounds will be gained during the non-stop feast fests that accompany this annual event. Yes, ladies and gentlemen -- and children of all ages -- I am talking about Super Bowl Sunday. You don't have to be a sports fan to participate. Barbara and I are hosting a Super Bowl party and of the 20 or so attendees, I would say maybe half could name the teams playing for NFL bragging rights (Tampa Bay and Oakland), their nicknames (Buccaneers and Raiders) and their coaches (Jon Gruden and Bill Callahan). But just about all our guests would be able to guess what's on the menu: pepperoni and cheese, chips and dip, nachos and cheese, wings and beer. Super Bowl parties have become about as predictable as the never-ending halftime show which will bore many to tears while driving the rest of us back to the food table for seconds and maybe even thirds! Heck, who am I kidding? Partygoers will only eat once. Unfortunately, that one meal will start at 6 p.m. and finish at 11 p.m. when the game finally ends! EDITOR'S NOTE: Mr. Bad Food's Super Bowl pick. (Hopefully, it won't end up being a Mr. Bad Pick pick.) Drum roll please. When the final gun sounds the scoreboard will read Oakland 27, Tampa Bay, 23. If eating were a sport, this Sunday would indeed be the super bowl of grub. Like many things in life, there's a right way and there's a wrong way to eat. Unfortunately, many of us have chosen the wrong way. And what better way to pull a dietary end-around than to belly up to a tailgate party buffet and eat like there's no tomorrow? Chicken wings... fried chicken... ribs... chips... dips...The latter could refer to you and me when we insist on overdoing it in the name of football. If eDiets employed referees they'd be tossing flag after flag our way and slapping us with a plate "piling on" infraction. Face it folks, finger foods washed down by beer or soda will foul up many a diet this weekend. Far be it from me -- a Penn State University grad and a lifelong New York Jets fan -- to tell you to pull the plug on your pre-game partying. Ain't gonna happen anytime before you-know-what freezes over. I am going to ask you to digest the revealing numbers (culled from the info-packed eDiets archives, mind you) I am about to serve up and then give our just-as-tasty alternatives a try. Yes, it could involve cooking rather than running to the grocery store deli or neighborhood fast food joint, but in the long run your belly and heart will thank you. Oh, one more thing: I know it may sound blasphemous to some of you, but why not give light beer a try this year? I was a die-hard Bud fan for many years. No real man drinks a light beer, I told myself time and time again. Heck, I even teased friends who reached for a Miller Lite rather than a full-flavored, full-calorie brew. Guess what? A few years ago I pulled a reverse play (I admit... it was waistline-induced) and became a fan of light beers. Now, on those rare occasions I imbibe in a regular Bud, I cringe at the taste. So give it a try. The calories you save really do add up. Are You Ready For Some Foodball? FRIED CHICKEN: Sorry Colonel... you can do your silly little dance somewhere else. Remember, just because its all-white meat, doesnt make it lean. One 6.5-ounce extra-crispy breast from KFC has 470 calories and 28 grams of fat. KFCs drumstick will set you back 195 calories and 12 grams of fat, and even that little wing manages to cram in 220 calories and 15 grams of fat! Heat oven to 400F. Line a baking sheet with aluminum foil and coat with nonstick cooking spray. Rinse chicken breasts in running water and pat dry. Pour buttermilk, crushed corn flakes, and flour seasoned with salt and pepper into three separate shallow bowls. Dredge each chicken breast in buttermilk, then in flour, back into buttermilk, then into corn flakes. Arrange corn flake-coated chicken breasts on baking sheet and bake, about 8 minutes on each side or until golden brown and cooked through. Makes 4 servings. Nutritional values per serving: 250 calories, 2g fat, 31g carbohydrate, 27g protein, 4g fiber and 1,870mg sodium. CHICKEN WINGS: How bad could they be? Theyre chicken, after all, right? That may be true, but wings are considered dark meat, which is more fatty than its lighter counterpart. And once you drench them in oil and dip them in blue cheese, they might as well be any other meat. Combine paprika, hot sauce and olive oil; add chicken and toss well to coat. Marinate chicken in refrigerator, about 1 hour. Heat broiler. Arrange chicken on broiler pan and cook, five minutes or until chicken is cooked through. Serve with dressing for dipping. Makes 6 servings. Nutritional values per serving: 120 calories, 2g fat, 13g carbohydrate, 14g protein, 500mg sodium, and 1 grams fiber. RIBS: A typical 8-ounce restaurant serving of barbecue pork ribs has 645 calories and 43 grams of fat. That's even more fat grams than youd get from an order of Chicken Tenders, a regular-size French fries and a vanilla milk shake from Burger King. So if youre following an 1,800-calorie diet plan, an order of ribs will give you more than 70 percent of your recommended daily limit for fat in one meal! We recommend you head down your supermarkets frozen food aisle and grab a box of Gardenburger Meatless Riblets (they're made from soy protein). Pop a riblet in the microwave for about three and a half minutes and you can get your flame-broiled fix for just 210 calories and 5 grams of fat. When topped with cheese, tomatoes and other healthy ingredients, these hearty nachos are the perfect way to stay on the ball while losing weight. Preheat oven to 400F. Spray a large heatproof platter or baking sheet with nonstick cooking spray. Scatter the tortilla chips evenly over the platter. Sprinkle them evenly with the cheese and green chilies and broil until the cheese melts (2 to 3 minutes). Top nachos with tomato, olives, onions, cilantro and jalapeno peppers. Serve immediately. Makes six 3/4-cup servings. Nutritional values per serving: 172 calories, 9 grams of fat, 4 grams saturated fat, 20mg cholesterol, 319mg sodium, 7 grams protein. 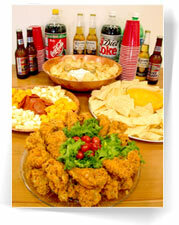 If you want to keep some more traditional football party fare, opt for low-fat versions. Some ideas from your plan include low-fat nachos, snack pizzas, picante potato wedges, hummus dip with crackers, crackers and cheese, sour cream dip with carrots, tortilla chips with salsa, baby carrots, popcorn, pretzels and cheesy pita chips. Just dont forget to pay attention to portion sizes! And now for some great advice for serving other game foods that'll score big with your guests. Turkey Chili: Substitute lean ground turkey breast or red and black beans for ground beef in your favorite chili recipe (use cooking spray instead of oil, too). Top with chopped tomatoes and peppers for a crunchy, hearty texture. Mushroom Burgers: Look for these cheesy, meatless burgers in your grocer's freezer section. Pile them along with sandwich-style pickles and all the usual burger fixings on whole-grain rolls, or slice them up and layer on mixed greens. Tofu Hot Dogs or Turkey Sausages: You'll feel like you're right in the stands when you bite into one of these smarter alternatives to beef or pork hot dogs and sausages. Load them up with deli mustard, relish, onions and peppers, or sauerkraut to boost the "fill you up" factor. Boca Nuggets: These soy-based bites taste just like fried chicken nuggets (see if the family can tell, we dare you! ), but they're much lower in fat. Serve them with barbecue sauce or honey mustard for dipping. Also look for boneless, skinless hot wings -- a terrific stand in for Buffalo wings alongside fat-free blue cheese dressing and crunchy celery spears. Baked Potato Skins: Bake potatoes, then slice in half and scoop out the center, leaving about a quarter-inch of potato flesh inside each skin; spray with butter-flavor cooking spray and broil, potato side down, 5 minutes or until browned. Turn and broil a few minutes more; top with imitation bacon bits and chives. Spicy Popcorn: Spray air-popped popcorn with butter-flavor nonstick cooking spray and sprinkle with cayenne pepper or Old Bay seasoning. Pita Chips 'n Mexican Dip: Cut pita bread into triangles and spray with olive-oil flavor cooking spray; broil until golden brown and crisp. Mix black bean dip and salsa; serve as a spicy pita dip. Call a time-out from alcohol. If youve been drinking alcoholic beverages, alternate with something non-alcoholic, like sparkling water with lime or diet iced tea. This will cut back on calories and prevent the loss of inhibition that can lead to overeating. Better yet, reach for water to keep you hydrated and aid in weight loss. One regular beer ranges between 150 to 200 calories, while a light beer has only about 100 calories. A 5-ounce glass of wine has about 100 calories, as does 1-ounce of alcoholic spirits such as vodka, gin or scotch. Dont forget: substituting juice for regular soda is like substituting regular sour cream for mayonnaise. Youre not saving calories! An 8-ounce glass of juice, unsweetened, has about 120 calories. Our special pre-game show continues now with additional insight from a veteran of the weight wars, Katherine Tallmadge, a spokeswoman for the American Dietetic Association and a frequent contributor to the eDiets Monday-Thursday newsletters. Super Bowl Sunday is just around the corner and you'll soon be driving to the supermarket or take-outs to buy provisions for your Super Bowl party. Most guys I know love to get together to play cards, watch sports or just hang out and talk. Left to their own devices, the food of choice may be nachos (1,400 calories a plate), baby back ribs (770 calories per pound), buffalo wings with blue cheese dip (1,000 calories per dozen), chips (1,050 calories per 7-ounce bag) with sour cream dip (500 calories per cup), and other high calorie junk food. Its whats easy -- and theyre used to it. But Ive found that when you serve healthy, tasty alternatives, theyre just as happy. So why not serve a plate of fresh fruit such as apple slices, grapes and pineapple? How about a tray of fresh crudites: carrots, cucumbers, red peppers with a nice dip made with fat free sour cream or a hummus style dip? My experience is the guys are pleasantly surprised at how delicious and enjoyable healthy foods are and they wont groan the next morning when they hop on the scale. Ive also had men tell me how much more they enjoyed the party because they didnt feel bloated and uncomfortably stuffed. More options include Barbaras Fried Chicken, Tallmadges Chili Non Carne" (see recipe below excerpted from my book, Diet Simple) served with baked chips. I love this simple, quick chili recipe. Of course theres zillions of ways to make chili, most dont need a recipe. But this ones easy to follow and everyone loves it. Its meatless but you dont miss the meat because its so flavorful. You should use the amount of garlic or chili powder that appeals to you. I like it hot and spicy! I double the recipe so I have plenty for the week. I use this dish as a lunch or dinner alongside a green salad. I also serve it at parties as a dip next to fresh tomato salsa, light sour cream and guacamole. Its perfect rolled up in a tortilla or stuffed in a taco with some reduced fat cheese. The basic recipe serves four and is great for Super Bowl parties. Saute the onions and garlic in the oil over low heat in a large pot until soft, 15 or more minutes. Add the chili powder and simmer for a few more minutes. Add the fresh green pepper and cook until al dente. Meanwhile, soak the bulgur in the boiling water for 15 minutes. Add all remaining ingredients including the bulgur and simmer slowly over low to medium heat until flavors are well blended and vegetables are cooked to the desired consistency ... a few minutes or longer, if desired. Adjust seasonings to your preference. Since many canned items were used, additional salt will probably not be needed. Calories 320, Total Fat 7g, Saturated Fat 1g, Cholesterol 0mg, Sodium 730mg, Total Carbohydrate 59g, Fiber 13g, Protein 12g, Vitamin A = 70% of daily requirement, Vitamin C = 120% of daily requirement, Calcium = 15% of daily requirement, Iron = 30% of daily requirement. Bottom Line: If every Sunday, you save your husband (and maybe yourself) a thousand calories by serving healthy party foods to him and his friends, he could lose 15 pounds in a year. Katherine Tallmadge is an in-demand weight loss and nutrition speaker and consultant with a 20-year private practice in Washington D.C. Shes also spokesperson for the American Dietetic Association and author of Diet Simple: 154 Mental Tricks, Substitutions, Habits & Inspirations.